How low can you go? Does it make sense to save money and purchase a low-capacity iPad, iPhone, or iPod touch, then extend its capacity using a wireless remote storage solution? With fast and cheap flash drives and USB external drives available, is it preferable to be thrifty when buying iOS hardware, and extravagant when considering the new types of remote and wireless personal file servers that are being released monthly? Think differently concerning if you really need that expensive 64GB iPad or iPhone. When you can quickly and affordably have access to zillions of songs, megas of movies, and gigas of photos on multiple, inexpensive USB flash drives and hard drives, think very differently and put the extra $100 or $200 into external storage. Kanex, IOGEAR, and Macally have varied approaches to the hardware and wireless features in their somewhat-comparable units. The latter two use the same interface for their dedicated iOS apps, and Kanex has its own iOS app interface. None of these apps are very good; all are flawed for usability and functionality, but they all work within a first generation concept range of acceptability. 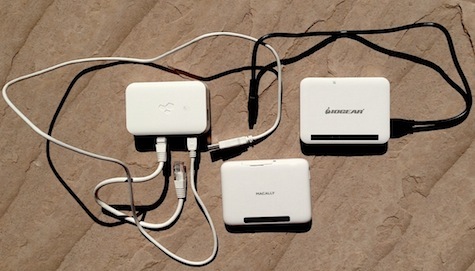 Kanex’s meDrive connects to a WiFi router with an included Ethernet cable, and meDrive gets its energy from a powered USB power adapter or USB port that is now built into many WiFi routers. Free iOS app download, installation, and startup are quick and efficient, as is the case on all three units. The app can’t recognize or load folders that are named certain ways (due to no spacing allowed), and Kanex tech support provides guidelines for naming conventions. Once everything is in order, your iOS equipment and your computers can view and download all items that have previously been placed onto your external USB flash drives and hard drives. meDrive is always running on your local network, so when you are in network range, your external storage is handy via the on-demand iOS app or Mac. IOGEAR’s MediaShair Hub duplicates everything the meDrive can do with its always-on Ethernet access point and single USB port, then adds a Wi-Fi radio and built-in battery for on-the-go content sharing, plus an SD-card slot, and subtracts an included Ethernet cable. MediaShair costs more and does more. The thought of a family of seven people simultaneously watching different streaming content is frightening, but these companies didn’t check with the local family therapists ahead of time, I suppose. IOGEAR’s printed manual is extensive and impressive, covering every possible use and configuration of their excellent personal file server. The free app for this product can read more file names and open more folders than the app from Kanex. Macally’s WIFISD Mobile Wi-Fi Pocket Drive and manual are essentially identical to MediaShair, and costs $20 less. (A charging cable is included, but was not attached when I took the photo above.) It is a fulfilling experience on the latter two units to have both Wi-Fi connectivity to the sharing gizmo and pass-through Wi-Fi access to the local Internet network. Setup for the full range of wireless streaming features is a little geeky and will require a few minutes, so be patient and contact the company’s support team without hesitation if you are new to this emerging technology. A year from now these innovative personal file servers will have plenty of company and competition. MyMac congratulates all three companies on getting their hardware and apps into the marketplace. Please improve the usability of your apps for the second generation releases, and you will have nearly perfect solutions to the storage limits of iOS equipment. I am very interested in this sort of device. I have used a Kingston Wi-Drive for a while (a small portable SSD with wifi, which can stream to multiple devices simultaneously and is VERY coss-platform – I have used it even with Android, Linux, and a Blackberry Playbook. I am now very interested in the ones that support USB flash drives and SD cards. The major problem that I have had so far, particularly if your intention is to buy a lower capacity iPad, is that the battery life of the devices I have tried or looked at is much shorter than that of the iPad or other tablets. A device with a battery life of 3-4 hours is of little use on, say, a long flight.